Access Church: How Good is Good Enough? Good people go to heaven - don't they? Sure they do. It only makes sense. Actually, it doesn't really make any sense at all. Smart, educated, accomplished men and women everywhere are banking their eternities on a theory that doesn't hold water. In this message, Rich Barrett will reveal what's wrong with the most popular theory about heaven - and what it really takes to get there. 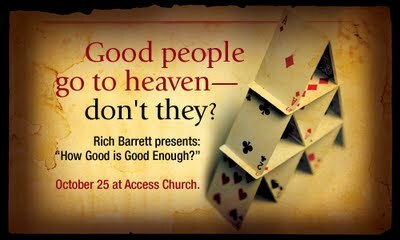 Join us at Access Church Sunday, October 25, at 10:30 am. See you there!